No, she wasn’t planning a different type of approach to the AFM to get the ukulele recognised as a musical instrument; she was doing her bit to prepare US industry against potential fire hazards. 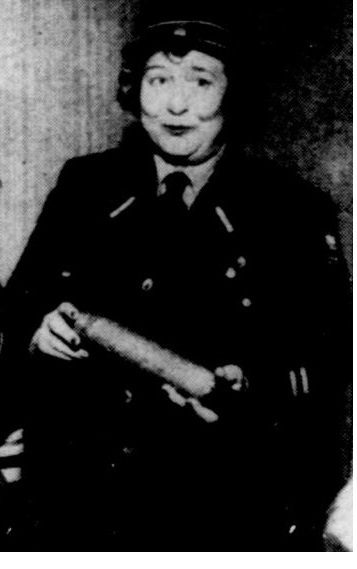 The Pittsburgh Post-Gazette published (4 May 1943) a picture of the Ukulele Lady without ukulele but holding a magnesium bomb — it was a dud. She was telling people at the AWVS Motor Corps how to prevent fire during an air raid. By 1943, some 66,000 women had been trained to deal with fires. Of course, people who play ukulele know an awful lot about fire bombs. In an earlier post, I mentioned May Singhi Breen’s preparation to take on the AFM union to get their recognition that the ukulele was in fact a musical instrument. A report on her failure in this attempt appeared in the Herald Journal of 3 January 1932. When she arrived with lawyer, testimonials and most importantly, her $125 (about $4000 in today’s dollars) ukulele, the powers that were would not even listen to her play. The AFM, represented by Joseph N Weber, said that the ukelele was a fun toy which isn’t allowed in orchestras, and anyone can make a noise on it in a matter of days [ed., I suppose anyone could make a noise on a piano in a much shorter time]. The ukelele would, in his opinion, never be recognised as a musical instrument — it was simply a novelty contraption which Ms Breen could play, he had been told, remarkably well. I understand that the AFM has changed its mind on this important matter.